Hannah is from Nikkie's first litter, and is a testament to the calm titled dogs that we have chosen to breed to. She was extremely easy to train and started testing at Master Hunter level at the age of one year. She has an unbelievable amount of drive and an excellent nose. She rules the field with style and grace. In the house, she is sweet and lovable. Sally is from Nikkie's second litter and she was born 07/01/2009. Sally is one of the finest dogs I've had the privilege to own and train. She has wheels to cover the field at a high rate of speed and a nose that finds them all. She is a loving and sweet dog who does not have a mean bone in her body. I truly enjoy every moment I spend with her. Sally has passed the NAVHDA Natural Ability test with a perfect 112 points for a Prize I.
Jedi was born 09/09/2009 and comes from an attractive pedigree. He has outstanding drive and is a natural retriever. Jedi passed the NAVHDA Natural Ability test with a perfect 112 points for a Prize I. 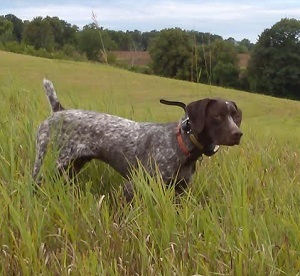 He also earned his AKC Master Hunter title in October 2011. He is available for stud to approved females. 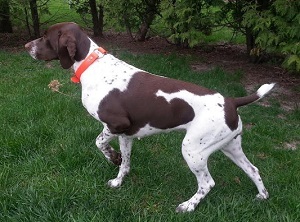 "Shining Star GSP is dedicated to breeding, training, and the raising of German Shorthaired Pointers for hunting and companionship." Max was an accomplished field champion, who throws great pups. He is a 1st generation decendant of FC Kj's Hightailing Saddle. Max is no longer with us, but is available for stud through artificial insemenation. 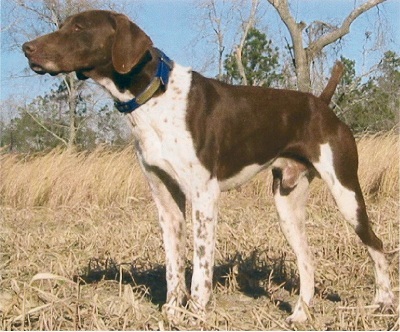 Binks was born 01/17/2011 and is the product of a phenomenal line breeding from Top Gun Kennel (which has extensively used Hillhaven’s Hustler in their line) on the sire's side and Dixieland on the dam's side. These two superior lines of genetics have brought us a wonderful dog with tons of nose, desire, and the willingness to please. 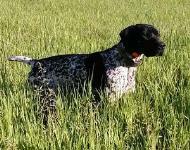 Binks passed the NAVHDA Natural Ability test with a perfect 112 points for a Prize I. 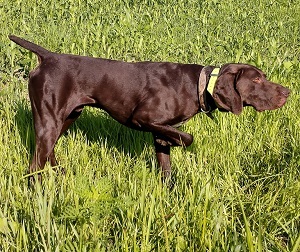 He also earned his AKC Master Hunter title in October 2013. He is available for stud to approved females. Vicky is all business from the second you let her loose in the field until the minute you kennel her up at the end of the day. In between, all she does is find birds and make you smile. 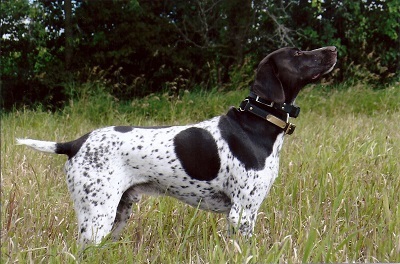 Vicky is an incredible bird dog with a pedigree to match. She earned a Prize II in the NAVHDA Natural Ability Test. Jack earned his AKC Master Hunter title on 10/20/2013. He has tons of nose and desire, and a willingness to please. I consider it an honor that I have had the privilege to train him. He is available for stud to approved females. 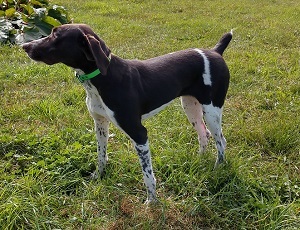 Striker is my first black and white gsp, and he was born on 06/12/2012. He is a son Sharp Shooters Man in Black MH and carries those exceptional genetics. He is a joy to train and hell in the fields. Striker completed his NAVHDA Natural Abilitiy test in August 2013 and earned a Prize I. 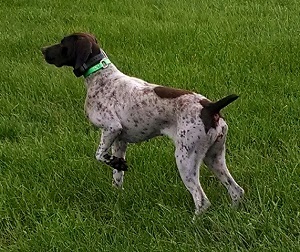 He earned his AKC Master Hunter Title on 10/25/2014. He is available for stud to approved females. Lolli is smooth as silk and as sweet as peach pie with a cannon for a nose. I just adore this dog. 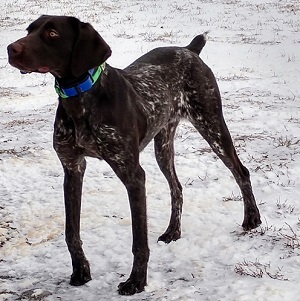 Shelby is a phenomenal bird dog with an incredible nose. This is coupled with an uncompromising willingness to please. She is hell on wheels in the field. Remi is an incredibly independent hunting machine. She has a phenomenal nose and a great desire to please. She is also an exceptional family dog. Bailey is the all around dog. 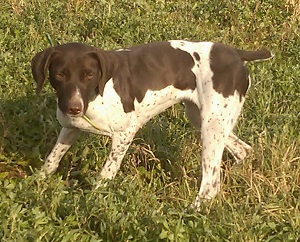 She is sweet and loving in the house, and she is a field sweeper who loves to retrieve. Georgia is an intense dog who has great leg and uncompromising prey drive. 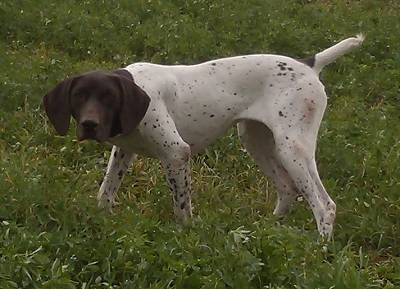 Mischief is a sensational hunting and companion dog, with a sweet personality, eager to please, trainability, and desire. Wishes is a sweetheart who loves to play. 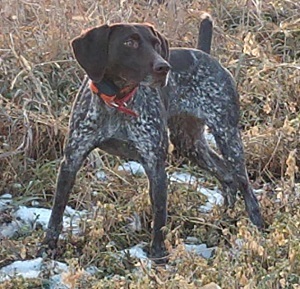 In the field, she is all business with a great desire to please and find the birds. Shining Star Jabba The Hut has all the tools needed - great nose, extensive prey drive, and lots of style – and that equals one amazing hunting dog!